On this website (and others), collectors of vintage R/C cars have over the years tried to categorize “variants” of vintage R/C cars as “Mk1, Mk2, Mk3” etc. This approach has proven popular, and it works OK for vintage RTR (ready-to-run) models. But it’s actually very misleading for kit-based models. So I’m now scrapping it for those, in favour of a simple naming convention of “Early”, “Mid” and “Late”. When collecting old toys and games, some people will pay thousands of dollars more for the packaging or box, than the item itself. Others send their toys away to have them (and the packaging) valued and then put inside plastic cases. If you collect old toys, how important is the condition of the packaging, to you? 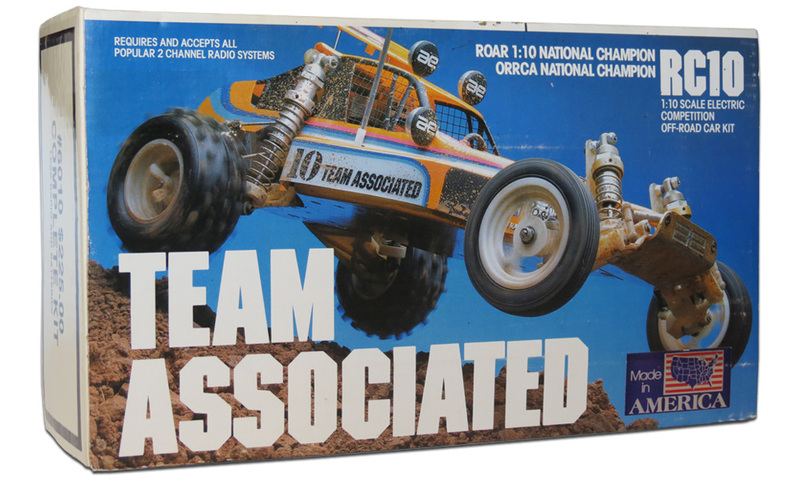 Remembered as a world-beater in competitive circles, the original RC10 buggy was a kit-based model and the first off-roader created by hobby-grade R/C company Team Associated (aka ‘Associated Electrics’), an American brand looking to redefine off-road electric R/C competition racing in the early 1980s. The RC10 achieved all that and more. But racing aside, this was a dream toy that would have made any kid the envy of all their friends – if they were lucky enough to have one.